In the annual cross country bonanza, one of the largest in the Midwest, Warsaw finished in the middle of a star-studded Class AAA field at the New Prairie Cross Country Invite. Triton’s boys also had a good showing in the mega-invite, placing in the top 15 as a team in Class A.
Tippecanoe Valley also got some good exposure running in the Class AA circuit. Warsaw’s girls didn’t have a runner in the top 20, but saw its times all run consistent to one-another. 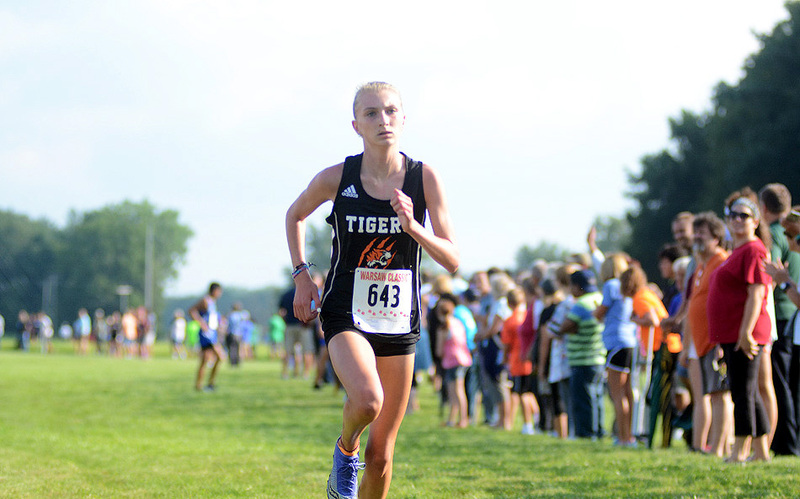 Angie Vijil-Sanchez had the top Lady Tiger time at 21:02, followed by Wini Barnett at 21:06. Megan Dawson (21:32), Amslie Howett (21:33) and Adree Beckham (21:36) made up the varsity top five. Taylor Gunter won the reserve race to highlight Warsaw’s day with a time of 21:30 and Ava Knight was the runner-up with a time of 21:36. Warsaw scored 318 points, sitting behind 10th place Munster’s 303 points. Indianapolis Pike won the team title with 108 points, edging Valpo by two points. Penn (162) and Mishawaka (225) were among the area teams in the top 10. Valley’s girls were 22nd overall in the Class AA circuit, scoring 620 points. Valeria Jimenez was the top runner for the Lady VIkes with a 76th place time of 23:18. Haley Hoover (24:31), Lorena Santiago (26:00), Ava Craig (27:23) and Lauren Sponseller (28:22) made up the scoring times for Valley. West Lafayette edged Culver Academy, 110-117, for the Class AA girls team title. Triton’s girls did not register a team score with just three competing, but had both Briana Wilhite (23:39) and Annie Hill (25:43) run season bests while Makenna May ran a 25:02 to finish in the top 100 of the Class A runners. In the boys races, Zeb Hernandez finished just outside the top 20 with a time of 16:57, four seconds behind New Prairie”s Jacob Corbett’s 20th place time to pace the Tiger results. Jack Horoho was next for Warsaw at 18:03, followed by Fernando Niebbia (18:40), Anthony Bass (19:01) and Noah Marshall (19:24). Sam Lechlitner led Warsaw in the reserve race with a second-place time of 17:02, with Tanner Stiver ninth at 17:48. Warsaw’s boys score of 531 was well off the pace, with Lowell winning the team title with a mere 151 points, followed by Highland at 159 and Valpo at 175. Westview was ninth at 262 and New Prairie tenth at 266 for area teams in the Class AAA top 10. Triton took 13th place among teams in the Class A race, scoring 375 points. Illiana Christian (Ill.) won the A title with 119 points, Bremen third at 177. Russell Reichard made the top 50 for the Trojans with his time of 19:06, good enough for 48th place. Brandon Kitch (19:30), Josiah Page (20:14), Jesse Page (20:16) and Breighton Treesh (21:07) made up the Triton scoring times. Tippecanoe Valley finished 23rd in the boys Class AA with 626 points. Matthew Howes led the Vikings with a time of 18:39, good for 43rd overall in the standings. Mitchell Smith (19:32), Jace Holloway (22:08), Chase Miller (22:14) and Grayson Sriver (24:52) made up the scorers for Valley. Bellmont ran away with the Class AA team title with 60 points, far away from South Bend St. Joe’s 148 and Culver Academy’s 163. Warsaw will compete Tuesday in a monster showdown in the Northern Lakes Conference final round robin races. The Tigers, Northridge and Memorial will all run in the triangle, with all three girls teams 5-0 in dual meets. Warsaw and Memorial are both 5-0 on the boys side and will square off alongside 0-5 Northridge. The races at Warsaw’s course on Logan St. begin at 5:30 p.m.
Triton will run next Saturday at the Culver Academy Invite. At a very competitive West Noble Cross Country Invite, NorthWood’s girls and boys had very good showings. For the NorthWood girls, Whitney Wolfe had the top placing in 37th with teammate Jen Martinez just behind in 38th place. Hannah Brubaker finished in the top 50 right in 50th place. NorthWood’s girls finished sixth in the team standings with 241 points. Fort Wayne Dwenger won the race with 44 points, ahead of runner-up Homestead’s 58 points. NorthWood’s boys were eighth at 235 with Dwenger also winning the boys race with 53 points to Homestead’s runner-up finish of 62 points. NorthWood will visit Plymouth in the final NLC round robin races Tuesday evening.